What does a chamber system septic design look-like? What are its properties? This article discusses the properties & installation of a chamber type gravelless or "no gravel" or "no rock" septic drainfield systems, offering installation specifications. Drainfields, also called leach fields, absorption beds, soil absorption systems, and leaching beds, perform the functions of septic effluent treatment and disposal in onsite wastewater treatment systems, conventionally called "septic systems"
Gravelless septic systems or "no gravel" septic system trenches use plastic or other prefabricated wastewater distribution systems which are buried in soil without the use of surrounding gravel. This article describes the third type, chamber septic systems for effluent disposal. Typical gravelless septic systems use a plastic chamber, a geotextile-wrapped pipe, or a polystyrene-wrapped pipe to distribute effluent into the soil. The necessary soil absorption area is provided by the perforated surface of the gravelless septic system components (or by soil at the bottom of a chamber) themselves rather than by the gravel and trench walls of a conventional septic drainfield. Gravelless or "no rock" septic systems can provide an acceptable effluent disposal system for sites with limited space for a drainfield or where gravel is not available or is quite expensive. 3. Chamber septic systems, using pre-formed plastic chambers (shown just above) buried in an earthen trench. Wastewater is delivered to the top of the chamber by a solid plastic pipe. Effluent seeps into soil across the bottom of the chamber. The empty chamber also provides effluent storage volume to handle peak wastewater flow loads. Chambers are available in widths varying from 16" across (at the bottom) to 34" wide and are placed in trenches ranging in width from 18" to 36". Synonyms for this design include "leaching chambers", "galleys", and "flow diffusers". Illustration courtesy of Infiltrator Systems, Inc., used with permission. (Infiltrator Systems Inc. contact information is listed below). 4. Vertical thin wall chambers: A fourth variation on gravelless effluent disposal systems is similar to the chamber system (#3 above), but uses pre-formed but thin plastic "chambers" which are inserted into a narrow slot cut into the soil; these systems diffuse effluent primarily through their sides into the soil. Consultants or supplies in this field can be listed at our alternative septic designers page at no charge by contacting me. Also see The Septic System Information Website. Technical reviewers welcomed and are listed at Reviewers. Question: Chamber Septic Feet to Equivalent Conventional Septic Drainfield Trench? How many feet of sewer pipe does 1 24x48 chamber equal. Like 1 chamber or 10/20/30feet of sewer pipe? do you use a big chamber for a septic tank? There you'll see that the equivalent feet of perforated rain line (conventional leach field drain trench) for a chamber system varies by manufacturer's specific product and its specifications. For each specific septic chamber system product and plastic pipe or chamber diameter, the manufacturer will indicate the disposal area provided by the product (per linear foot, for example). But your engineer and installer need to evaluate your soils and daily wastewater usage to determine the amount of leaching area needed for your site. Also the equivalent area of conventional field (or length) will depend on the gravel-less pipe size. The 8” size pipe will equal to 2-foot wide conventional trench; and the 10” size will equal a 2.5-foot wide trench. To determine the required linear footage of either pipe size, first determine the square footage by dividing the design sewage flow by the appropriate soil’s long term application rate. Then divide this total square footage area figure by either 2 feet (for 8”) or 2.5 feet (for 10”) to establish the linear footage amount. Continue reading at GRAVELESS SEPTIC DESIGN CRITERIA or select a topic from closely-related articles below, or see our complete INDEX to RELATED ARTICLES below. 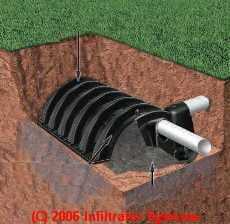 GRAVELLESS SEPTIC CHAMBER SYSTEMS at InspectApedia.com - online encyclopedia of building & environmental inspection, testing, diagnosis, repair, & problem prevention advice. Questions & answers or comments about the design, installation, maintenance & repair of chamber type septic effluent absorption systems.